VIDEO: Cavaliers vs. Raptors Game 6 Full Highlights - 2016 NBA Eastern Conference Finals - Balita Boss! 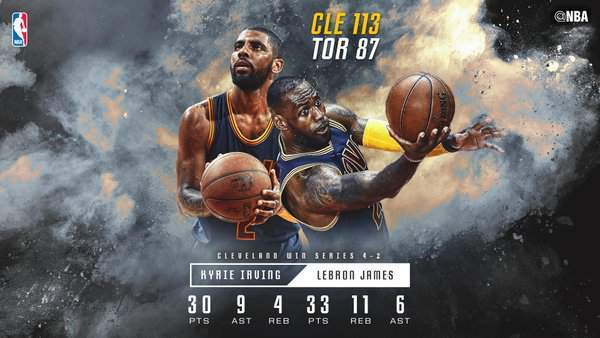 The greatest season of Toronto Raptors came to end following a 113-87 loss to the Cleveland Cavaliers in Game 6 of the 2016 NBA Eastern Conference Finals. LeBron James, the first NBA superstar to go to a sixth straight final since Bill Russell in the 1960s, scored 33 points to lead Cavaliers to a series clinching victory. He also had 11 rebounds and six assists. The four-time MVP had plenty of help from Kyrie Irving who scored 30 points with nine assists. Kevin Love had 20 points and 12 rebounds for Cleveland. Kyle Lowry finished with 35 points and DeMar DeRozan had 20 for Toronto.